Some recent analysis from Credit Suisse looks at how credit markets are pricing corporate leverage in terms of spread. Intuitively the higher the leverage (risk) of a company, the wider the the spread for that company's bonds. Many credit traders and analysts look for anomalies in this relationship to see if a particular company's bonds may be mispriced. A broader analysis would compare the average spread for a group of companies with the average leverage, to see where they fall on the spread-leverage plot. A deviation from a linear relationship may potentially be an indication that a whole group of companies is too rich or cheap relative to the rest of the market. For example in 2010 the B rated credit spreads were too tight while CCC credits too wide based on the spread-leverage relationship. But recently the market has become more "rational" about the way that it prices risk. 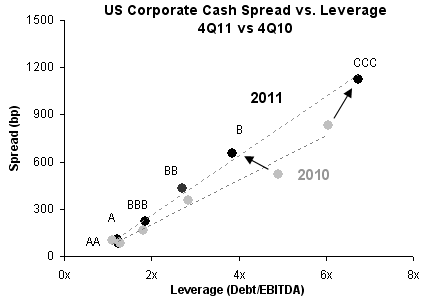 The more leveraged companies (B and CCC) fall into a straight line in the spread-leverage plot (see chart below). This means that it has become more of a "credit picker's" market. With risk fairly efficiently priced, the game now is to select individual credits that will outperform based on fundamentals.